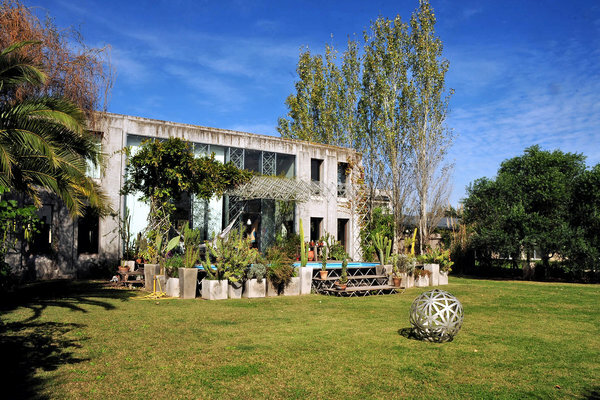 Molecule House, a villa in a gated community outside Buenos Aires, is on the market for $1.35 million. This rectangular building, known as Molecule House for the system of interlocking aluminum rods and connectors that makes up its foundation, has 3,229 square feet of space over two floors. Its signature modular geometric structures also act as a decorative feature throughout the house — in ceilings, along windows, even as table legs and balusters. It is being sold furnished. The central living room has a double-height ceiling and two glass-paneled walls; like most of the house the floor is in a reclaimed wood called Incienso, with a heating system underneath. It is flanked on one side by the dining room, on the other by the kitchen, which has two freestanding counters topped with thick slabs of reclaimed pine. Appliances, among them an Ariston oven and stove, are stainless steel. Upstairs, the master suite has an air-conditioned bedroom, a white-tiled bath with a skylight and a walk-in closet. On the other side of the house, at the far end of an open walkway, are two bedrooms and a shared bath. The property of almost 11,000 square feet is landscaped with palm and silk floss trees, flowering shrubs and a collection of cacti. A wooden deck leads back to the pool; a small geodesic dome provides a sculptural element. Molecule House is in La Celina, a gated community of 70 homes on large lots. Polo fields are within 15 minutes’ drive; Buenos Aires is about 45 minutes away. The market in Buenos Aires, which traditionally uses American dollars, is stagnant, in part because the government recently restricted real estate transactions in foreign currencies. Wary of the Argentine peso with its history of high inflation and depreciation, many sellers are holding back. “The number of sales in the main market, Buenos Aires, are down 40 to 50 percent compared to the previous year, which was not a great year to start with,” he said. But according to Martin Bricca, a managing partner of Buenos Aires Habitat, it’s a good time to buy. Those who are selling, he said, are not averse to negotiation. “Three years ago, if you offered 30 percent less than the asking price, the owners would say no,” he said. Sellers today often accept offers 15 to 20 percent under asking price. Most foreign buyers in the Buenos Aires area are from North America and Western Europe, typically Britain, Italy and France. There are no restrictions on foreign buyers, but financing must be obtained at home, as Argentine banks generally don’t provide mortgages. Elias Kier Joffe, the managing partner of the Buenos Aires Law Firm Kier Joffe, described real estate transactions as straightforward, explaining that Argentines typically rely on notaries public and don’t hire lawyers. But given the recent restrictions on foreign currency, Mr. Joffe strongly suggested that foreign buyers hire a lawyer, even before contacting an agent for a property search. The lawyer, notary and closing costs together make up about 3 percent of the sale price, he said. Foreign buyers usually wire their payments into the bank accounts that many sellers maintain abroad. The payment method must be stated in the purchase agreement and the account declared to Argentina’s Federal Administration of Public Revenue. The broker fee is 4 percent of the sale price; additionally, a transfer tax of 3.6 percent is typically split between buyer and seller. Property tax is $1,200 a year, maintenance $400 a month. This entry was posted in English, Real Estate and tagged argentina, attorney, buenos aires, law firm, law office, lawyer, legal, real estate on October 1, 2015 by Elias Kier Joffe. Foreign companies can operate in Argentina by registering with the Public Registry of Commerce (Registro Público de Comercio), as a branch or a subsidiary. Subsidiaries are created by setting up a business company. The commonest types are the Corporation (known as Sociedad Anónima or S.A.) and the Limited Liability Company (known as Sociedad de Responsabilidad Limitada or SRL). Both, branches and subsidiaries, are subject to the same tax regime. In Argentina, the Argentine Companies’ Law (LSC, Ley de Sociedades Comerciales), considers that a branch (the “Branch”) is a decentralization of the company’s headquarters (the “Headquarters” or the “Company”). The Branch is governed by the laws of the country of origin of the Headquarters, and thus, it is authorized to perform all the acts that are permitted to the Headquarters. As a result of the relationship established between the Headquarters and the Branch, the former is indirectly responsible for the transactions carried out by the Branch. Even though the Branch has no limitations to have its own assets, it is not obliged to have a specific capital stock. However, it must keep separate accounts from the Headquarters and submit its Financial Statements every year before the Public Registry of Commerce (the PRC) of the City of Buenos Aires. The transactions of the Branch do not generate much administrative control, as long as there are no meetings of the partners, shareholders or board of directors and it is not necessary to keep a record of the minutes, either. However, the Branch must take the necessary administrative measures, such as the registration with the PRC and with the social security entities and tax authorities. Likewise, every year when the Branch submits the Financial Statements, it must inform the PRC about any change that might occur pursuant to what is set forth in item 4. (v) described as follows. 1. Certificate of good standing issued by the Secretary of State or the relevant public office certifying that the company is duly authorized or incorporated and in good standing pursuant to the laws of its country of origin. This certificate must also state that such company is under no liquidation or any other kind of legal proceedings that result in restrictions imposed on its assets and/or activities. 2. Copy of the company’s bylaws or articles of incorporation, including any amendments thereto. (c) to establish a legal domicile in Argentina. (c) establishes a legal domicile in Argentina. (a) that the development of the Company’s activities or its main activity or activities is not prohibited or legally restricted in its place of origin. (b) that the company complies with any of the following conditions outside the Argentine Republic: (i) of the existence of one or more branches or permanent agencies in good standing; (ii) the ownership of fixed non current assets or exploitation rights on third parties’ assets of the same kind; (iii) interest ownership in any other company in the form of non current assets, in accordance with the definitions set forth in the Generally Accepted Accounting Principles (GAAP). (c) of the company’s shareholders / partners, indicating: (i) name and surname or business name of the shareholder; (ii) domicile or registered office; (iii) corresponding number of passport or ID, or else, the data of registration, authorization or incorporation; (iv) amount of shares, votes and ownership percentage of each shareholder. Please note that all the documents to be submitted before the PRC must be duly certified and legalized by a consulate or the Apostille (Convention de La Haye 1961). A subsidiary is a separate entity, independent from the headquarters (the “Subsidiary”). It has its own duties and obligations, a capital stock and its own administrative and management body. The subsidiary is liable to third parties with its own assets, and thus, the headquarters is not responsible for the operations carried out by the subsidiary. However, this protection has been recently questioned by some local courts. In order to set up a subsidiary, a foreign company must be registered in Argentina pursuant to what is set forth in section 123 of the Argentine Companies’ Law (“LSC”), and this is only with the aim to participate as a shareholder or partner in a local company, regardless of whether it is a Corporation (“SA”) or a Limited Liability Company (“SRL”). The procedure to register a foreign company for these purposes is similar to the procedure applicable to a Branch, pursuant to what has been previously set forth in item A.4. 5. Statement subscribed by one of the company’s officer individualizing its composition and the ownership of its capital stock. The documentation must be sent with the due certification before a notary public and the authentication by the Argentine Consulate of the place that granted it, or by the Hague Apostille, as it may correspond. Finally, if there is not enough time for the registration of the company’s shareholder, it is possible to register other provisional shareholders, who shall transfer their shares to the company 123 of the Argentine Companies’ Law (LSC, Ley de Sociedades Comerciales), shall transfer their shares to them. How is a commercial partnership or corporation established? Companies may be established by a written public or private instrument (section 4 of the Argentine Companies’ Law (LSC, Ley de Sociedades Comerciales). . The instrument of organization is an agreement. The instrument of organization is an agreement In case of a corporation it is called Bylaws. If you are planning to set up a company or do businesses in Argentina, please click on how to invest, and you will find the main characteristics of the legal regime in force regarding the different aspects to be taken into the account at the moment of investing in this city. The following is a brief description of the general principles applicable to the distribution of dividends of local companies and the repatriation of capital from a branch to its headquarters, according to the Argentine legislation. The general principle for the distribution of dividends is reflected in section 68 of the Argentine Companies’ Law (“LSC”), which provides that the dividends can only be approved and distributed when, once the fiscal year is closed, there are realized and liquid profits resulting from the balance sheet that was made according to the law, the bylaws, and approved by the shareholders’ meeting; “realized and liquid profits” are understood as the net profits from the fiscal year, specified with objective data, and which have an implicit irrevocable nature. The profits distributed in breach of that principle are repeatable, pursuant to the provisions of the second paragraph of said section, except if they are received in good faith, as set forth in section 225 of the Argentine Companies’ Law (“LSC”). On the other hand, section 71 of the Argentine Companies’ Law (“LSC”) adds that the profits cannot be distributed until the losses of previous fiscal years are covered, and according to what is set forth in the second paragraph of the abovementioned section, this principle is not applicable in the case in which the managers, directors or syndics are paid with a percentage of the profits, and the shareholders’ meeting stipulates the payment of their remunerations even when the losses of the previous fiscal years are not covered. According to section 261 of the Argentine Companies’ Law (“LSC”), the maximum amount that can be received by the board members or the Supervisory Committee (including salaries and other remunerations for their performance in their permanent technical and administrative roles) shall not exceed twenty five percent (25%) of the profits. This maximum amount shall be limited to five per cent (5%) when dividends are not distributed to shareholders, and it shall be proportionally increased according to the distribution, up to the limit of twenty-five percent (25%) when all the profits are distributed. The abovementioned general principle of section 68 of the Argentine Companies’ Law (“LSC”) is incorporated by section 224 of the Argentine Companies’ Law (“LSC”), corresponding to Corporations (“S.A.”). This section also contemplates the prohibition to distribute anticipated dividends, except for those companies that are included in section 299 of the Argentine Companies’ Law (“LSC”), i.e., those companies that make a public offering of their shares, have a capital that exceeds $10 million, have a mixed economy, carry out capitalization or savings transactions, exploit public concessions or services, and control or are controlled by the above-mentioned companies. In this case, said companies have the possibility of distributing anticipated dividends affecting partial profits obtained by the company during a period that does not coincide with that of the annuity of the fiscal year. Anyway, according to the legal principles and caselaw, we understand that the anticipated distribution of dividends is subject the effective closure of the fiscal year, with liquid and realized profits, so that the permit the anticipated payment of distributed dividends. Besides, section 78 of General Resolution 7/2005 provides that the term for the payment of dividends, which shall appear in the bylaws, shall not exceed the duration of the fiscal year in which they were approved. If the bylaws do not refer to this, the shareholders’ meeting shall be able to establish a special term for the payment of dividends, which shall not exceed 30 days. If the shareholders’ meeting does not establish this special term, the dividends shall be at the partners’ disposal as of the day following the shareholders’ meeting in which their distribution was approved. The payment can be made in periodical installments. Besides, section 143 of the abovementioned GR 7/2005 provides that if the distribution of anticipated dividends is approved, this decision shall be communicated to the Inspección General de Justicia (“IGJ”, Companies’ Control Authority) within a period 10 business following the adoption of this decision, including the supporting documentation. According to the exchange regulations in force, if the distribution of dividends is approved according to the provisions of the Argentine Companies’ Law (LSC, Ley de Sociedades Comerciales), there are no restrictions to the foreign exchange outflow under such concept. In that sense, the dividends approved by the Shareholders’ Meeting can enter the foreign exchange market and be drawn to foreign investors. For further information, please see the exchange regulations in force which were issued by the Banco Central de la República Argentina(“BCRA”, Central Bank of the Argentine Republic). Communication A 3859 issued by the Central Bank of the Argentine Republic (BCRA, Banco Central de la República Argentina) and its amendments establishes that “…the entities that are authorized to carry out exchange transactions can make transfers abroad for the payment of profits and dividends corresponding to past financial statements certified by external auditors”. According to this regulation, the local entities authorized to make foreign exchange transactions make transfers of profits from Argentine branches to their headquarters. III. Accounting certificate evidencing the nature of the profits of the funds that are sent from the branch to the headquarters. III. submission to a period of 15 days in which the creditors of the branch can oppose to such reduction of allocated capital. Regarding the exchange regulations, Communications A 4662 of the BCRA and their amendments establish the concepts through which non residents can have access to the Single Free Exchange Market without requiring prior conformity from the Banco Central de la República Argentina(“BCRA”, Central Bank of the Argentine Republic). Among others, the following is established: “…1.13. Repatriations of direct investments in companies from the private non fiscal sector, that are not controlling companies of local fiscal entities, as long as the investor registers the permanence of that investment in the country for a period no shorter than 365 consecutive days, for the following concepts: … 1.13.3. Capital reduction decided by the local company. It is worth mentioning that the authorization for non residents to make transfers under this concept corresponds to 05.11.07; before then, no transfer under the concept of capital reduction was permitted (neither for branches nor for subsidiaries). (ii) In the case of choosing any of the abovementioned alternatives, it is recommendable to previously consult the intervening exchange entity in order to determine if there are no diverse opinions about the operational procedure to be used, which can be frequent on the market. In order to buy a property in the Argentine Republic, foreign investors shall not only show their legal capacity but also their contribution of the necessary funds and their origin. For further information, please enter the guide to real estate market – “Other guides of interest”. This entry was posted in English and tagged argentina, attorney, buenos aires, doing business, law firm, law office, lawyer, legal, real estate on August 11, 2015 by Elias Kier Joffe. In an area where booming real property markets have federal governments from Chile to Brazil to Colombia warning of prospective property bubbles, Argentina stands out as a breast. Two years after President Cristina Fernandez de Kirchner clamped down on Argentines’ investment of bucks, the currency of option for real-estate purchases, the apartment sector is grinding to a stop. While costs soared to documents in Manhattan, a high-end strip in Santiago, Rio de Janeiro and Medellin, Colombia, in Buenos Aires they fell a typical 1.2 percent in the second quarter from the previous 3 months, the very first decrease in information that returns to 2005. “The primary concern in Argentina is that the property market has traditionally been transacted in bucks so when you make it impossible for individuals to source dollars liquidity obtains interfered with,” claimed Bret Rosen, managing supervisor of research at Jamestown Properties LLC in Nyc. Fernandez’s foreign-currency curbs properly put home acquisitions unreachable for several Argentines due to the fact that they would certainly be required to purchase dollars on the black market for 60 percent above the formal rate. Sales in Buenos Aires dove 34 percent in the first five months, the biggest decrease since the 2001 economic dilemma that finished in the government’s $95 billion connection default, baseding on the Buenos Aires Notary College. Now Fernandez is attempting to revive the market by supplying to forgive taxes owed on undeclared dollars if they’re purchased property. Argentines can trade funds held abroad for central-bank given out certificates that can be utilized in property transactions and retrieved for dollars by the vendor of a residential property. The plan has only attracted $8.5 million given that it started on July 1 since financiers beware the dollar-starved federal government will attempt to continue the greenbacks, according to Florencia Cecchini, realty agent at Matty Pell & Asociados in Buenos Aires. “My customers obtain an ulcer whenever I raise the subject,” she stated. “They do not wish to become aware of it because they don’t trust they’ll have the ability to get real bucks.”. The Argentine government iced up savings account and turned dollar savings in to pesos at 30 percent of the worth after the default. The nation has actually been secured out of global credit rating markets since then, while decade-long cases in U.S. courts with holdout financial institutions from the country’s 2005 and 2010 financial obligation restructurings requiring to be paid completely are adding to making Argentine securities the riskiest in the world. Reliant on regional funding, the government has diminished worldwide reserves and published money at a fee of concerning 30 percent a year, fueling the fastest inflation in the Western Hemisphere. Rate rises, tightening up money controls and unforeseeable legislation– consisting of the nationalization of oil company YPF SA in April 2012– triggered financial growth to fall to 2 percent in 2012, the slowest since 2009, as financial investment and production dropped. Real property is typically paid for upfront as the double-digit rising cost of living fee undermines banks’ capability to supply long-term payday loans. A five-year home mortgage has typical borrowing expenses of 18 percent, baseding on the central bank, compared with the 24 percent inflation rate determined by personal financial experts. Official information, which have actually been tested by the International Monetary Fund, shares customer costs are rising at half the fee. Just 14.9 percent of all home acquisitions in the district of Buenos Aires utilized home loans in 2012, down from 15.3 percent in 2011, baseding on Buenos Aires real property research company Reporte Inmobiliario. The share hasn’t exceeded 21 percent in the previous 10 years. Property sales in Buenos Aires toppled 27 percent last year from 2011, the greatest drop in Reporte Inmobiliario data that goes back to 1998, and the just the fourth annual decrease after 2001, 2004 and 2009. “The market was virtually paralyzed with the currency controls since the wonderful bulk isn’t really going to accept pesos for their property,” German Gomez Picasso, a supervisor at Reporte Inmobiliario, stated in a telephone meeting from Buenos Aires. “They would rather simply hold on to their residential property instead.”. Some real estate companies are beginning to price their tasks in the regional currency. Designer Alan Faena accepted pesos to complete marketing concerning 25 percent of his house structure in the Buenos Aires area of Puerto Madero, which he helped build in to the most pricey in Argentina’s resources from old abandoned factories by the riverside in the 1990s. Money controls make buying Argentina “difficult,” he stated, “You do whatever you can to adapt.”. Faena, developer of the Faena Hotels and resort and Faena Aleph Residences, has no plans to invest a lot more in Argentina. As an alternative he is finishing 6 jobs in Miami– a household structure, a resort, a fine arts center, a shopping gallery a playground and a marina– with a $600 million financial investment from his companion, Ukrainian-born American billionaire Len Blavatnik. He stated he’s sold HALF of his condo building set to be finished in September. Argentines finding to get away from money controls, slow-moving financial growth and rising inflation surpassed Brazilians in 2012 and became the largest Latin American customers of property in the UNITED STATE by investing $2 billion, baseding on a June 24 record by the National Association of Realtors. In Chile, home prices shot up as much as 20 percent in December and were at record highs in April, baseding on the Chilean Construction Chamber. Colombia’s home costs expanded a yearly 5.1 percent in real terms in the third quarter, prompting Yale University’s Robert Shiller to say the boom appears like the arising bubble in U.S. real estate a years back. The federal government’s plan to switch out dollars with main bank-backed certificates might aid increase the market, according to Juan Martin Olivera, a real property broker and public notary at Escribania Olivera. “We’re all hanging around to see just what occurs with that initial person who goes to the financial institution,” Olivera stated in a telephone meeting from Buenos Aires. “If all works out, after that it needs to bring some alleviation to the market.”. Sales in Buenos Aires rose an ordinary 5.6 percent in the 10 years with 2011 as Argentines sought to keep the worth of their cost savings in real property. The peso weakened every year since 2003 and is forecast to move 14 percent versus the buck this year, the most in emerging markets, according to data put together by Bloomberg. Fernandez’s currency controls and the tax amnesty strategy are readied to fail as they offer temporary relief as opposed to concentrating on slowing rising cost of living and instilling assurance in the federal government’s policies, said Juan Pablo Fuentes, a Moody’s Investors Solution economic expert in West Chester, Pennsylvania. “They will not be successful in bring in capital by doing this,” he shared in a telephone interview. “No one will certainly reputable a government that continuously violates regulations and does not worth contracts.”. This entry was posted in English, Real Estate and tagged argentina, attorney, buenos aires, law firm, law office, lawyer, legal, real estate on July 29, 2013 by Elias Kier Joffe. In a speech last November, President Cristina Fernández de Kirchner regretted that she did not possess “a little machine to print dollars”. Over the past few years, Argentina’s international currency reserves have slid considerably. Since the country is virtually blocked from international capital markets, using reserves is its only way to pay off its remaining debt. To protect those reserves, Ms Fernández has effectively blocked the sale of dollars at the official rate since she was reelected in 2011. The policy has succeeded in reducing capital flight, but expensive energy imports and limp tourism figures have continued to erode the reserves, which fell by $4.7 billion in the first five months of 2013, to their lowest level in six years. Economists do not expect that downward trend to slow. Quantum Finanzas, an economic consultancy, predicts that reserves will fall by another $3.6 billion this year and by $9.7 billion in 2014. Ms Fernández’s “dollar clamp” has also created a hungry black market for dollars. As they watch inflation ravage their peso savings by 25% a year, Argentines are willing to pay prices far above the official rate to get their hands on greenbacks. At the beginning of May the black market rate, or “blue” dollar as it is known in Argentina, shot to 10.45 pesos to the dollar, nearly twice the official rate. Ms Fernández is understandably anxious to reduce the size of the black market and find a new source of dollars. In May, following the blue dollar’s spike, she announced a plan that aims to accomplish both those goals. The scheme, referred to locally as the “laundering law”, invites those with undeclared dollars to invest in property and the energy industry without facing penalties for their previous financial chicanery. The government believes that Argentines have about $160 billion tucked under their mattresses or hidden away in foreign bank accounts. That is about four times the value of Argentina’s foreign currency reserves. Under the plan, citizens can trade their dollars for two financial instruments: a dollar-denominated bond for investments in Argentina’s energy sector, and a dollar-backed certificate valid for property transactions, known as a CEDIN. Whereas the energy bonds will not launch until July 17th, the CEDINs made their entrance on July 1st. In exchange for their surrendered dollars, investors will be awarded a certificate of equal nominal value which must be spent on buying or renovating a house, business premises or land. The recipient of the CEDIN may then sell the certificate or cash it in for real dollars at the Central Bank. Alejandro Vanoli, head of the financial services regulator, declared that the certificates will have a “revitalising” effect and “bring an interesting level of liquidity to the economy”. The market is equally pessimistic. Some 70% of estate agents doubt that the CEDINs will reinvigorate the property market, which has been damaged by the government’s foreign-exchange controls. Argentines used to buy and sell their houses in dollars; the crackdown has therefore resulted in 16 consecutive months of falling sales. They fell by 35% last year and by 41% in the first three months of this year. Construction also recently suffered its worst decline in 10 years. Some estate agents are more upbeat. A banner on Tizado Property’s home-page reads: “The CEDIN is real. It is time to invest in bricks.” But Tizado is in the minority. Although the CEDIN may have a modest effect on reversing downward trends in the property market and construction industry, it is unlikely to prove a panacea. By July 3rd, two days after the CEDIN’s debut, the government had yet to sell a single certificate. In Mr Kiguel’s words, the hope that the CEDIN will stop the fall in reserves seems to be “more based on a fantasy kingdom than the reality”. This entry was posted in English, Real Estate and tagged argentina, attorney, buenos aires, law firm, law office, lawyer, legal, real estate on July 4, 2013 by Elias Kier Joffe. The Argentina Central Bank regulated the CEDIN, a trade bond that allows its holder to purchase property and use it as an alternative method to paying with US dollars in order to acquire real estate assets or any other transaction as long as both parts involved in the transaction agree. The bonds will have the power to purchase urban and rural property as well as commercial businesses and construction materials. Those applying to purchase the bonds will transfer their money to a financial entity that eventually will receive the same amount of dollars in CEDIN bonds from the Central Bank. Once the transaction is complete, the bank will execute automatically another transfer back to the Central Bank trough an electronic operation known as “Mercado Electrónico de Pagos” (Payments Electronic Market). The CEDIN bonds won’t have an expiration date, and the banks won’t charge holders any commission or interest. This entry was posted in English, Real Estate and tagged argentina, attorney, buenos aires, cedin, law firm, law office, lawyer, legal, real estate on June 12, 2013 by Elias Kier Joffe.